Little, Brown Books for Young Readers, 9780316200639, 48pp. Peter Brown is the author and illustrator of many bestselling children's books, including Children Make Terrible Pets, A Creepy Pair of Underwear, The Curious Garden, and The Wild Robot. He is the recipient of a Caldecott Honor for Creepy Carrots!, two E.B. White Read Aloud Awards, a New York Times Best Illustrated Children's Book award, and a Children's Choice Award for Illustrator of the Year. Peter's website is www.peterbrownstudio.com. *"This is a book made for storytime, with its bold mixed-media illustrations that work almost like a storyboard moving left to right...The happy ending, almost a reverse of Where the Wild Things Are, includes everyone discovering the fun of being at least a little bit wild." *"Readers who prefer the view from underneath the dinner table will find a kindred soul in Brown's brightly burning character who knows that the wilderness is always waiting, should the need arise." 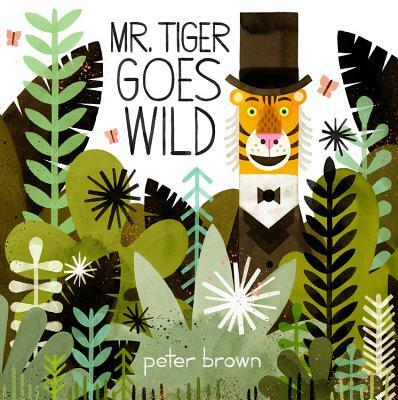 "Peter Brown depicts his hero as a bright pop of orange...gleefully escaping to a Rousseau-like tableau of dense ferns, soaring palms and cascading waterfalls."